Not available in a showroom near you ever – its purpose is as a debating point and research showcase – the F 015 re-conceptualizes the purpose of a car. Tellingly, rather than reveal it at a motor show, Mercedes-Benz selected the Consumer Electronics Show (CES) in Las Vegas, the world’s biggest tech fest: a signal that this is not just a car. It is also the company’s riposte to latent threats by Apple, Google and other tech firms that they will disrupt the world of cars like they disrupted the world of the PC. Thomas Weber, effectively the global number two at Daimler, the parent company of Mercedes-Benz, spoke on why they had developed it. “We asked ourselves, ‘What is luxury [motoring] in the future?’” he said. “It is time, space and access to information.” That was the driving force behind the future driving concept. As the executive board member in charge of research and development for the world’s leading luxury car company, Weber’s view is carefully observed by industry watchers. The monolithic design of the car gives passengers the largest possible space, he says. The inside, upholstered in white leather and open-pore walnut wood, has four rotating chairs, allowing guests to look at the road or each other. The door panels are touch screen, allowing passengers to call up contacts, information, the route, music or points of interest along the way. Unlike the original cars Google produced, there’s a steering wheel, should you feel the need to take over. Also unlike Google’s cars, it feels like a car, not a disposable electronic device. The car is, in part, a response to what Mercedes-Benz feels will be one of the major issues of the future: a burgeoning urban population. As the world moves to live in the city, roads will become increasingly congested. An automated car provides two solutions to the problem. Firstly, it gives the passenger time back, free to do what they want instead of driving. Secondly, it allows for cars to be shared; once a car has dropped off one passenger, it is free to collect another rather than sit in a car park. 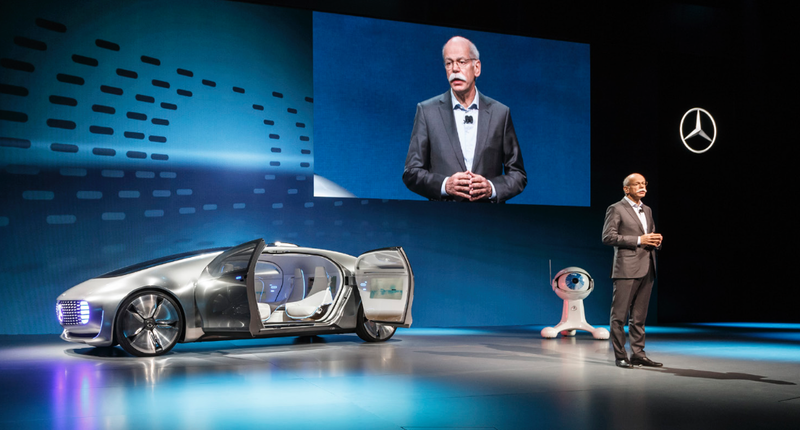 Weber believes that while a self-driving car from Mercedes may be an efficient space when it is driving itself, it will still provide pleasure when you want it to, unlike other modes of transport. He does not believe that driving will become obsolete. One such issue is strong internet signal; creating a bandwidth strong enough to control a full highway requires creating this digital infrastructure. Manufacturers will also have to wait until the legal framework is in place. Who is to blame if an autonomous car hits a pedestrian? What if a car was faced with a moral dilemma: for example, a mother pushes a baby in a pram into the path of an autonomous car on one side, as a cyclist is overtaking it on the other. Which way should it be pre-programmed to go? An autonomous car, for all its computing power, will not make decisions of its own: it will do what it has been told to do. Weber is keen to have these discussions early. “Legal discussion, social discussion, acceptance discussion – these things take time,” he says. “But we have cars on sale with first situations of this technology. We have a road map.” The first autonomous cars will probably be developments of today’s self-parking cars, with drivers taking control at times. Legislators have already started thrashing out these details and manufacturers have begun to steadily introduce autonomous elements, easing the population into the idea with the expectation that fully autonomous cars will be on the road as early as 2025. For many, that remains a frightening thought, but we have been entrusting our lives to aeroplane autopilots for years. At least style needn’t be a worry; with Weber in charge, autonomous cars will have plenty of panache. For many, that remains a frightening thought, but we have been entrusting our lives to aeroplane autopilots for years. At least style needn’t be a worry; with Weber in charge, autonomous cars will have plenty of panache.